Fanny got up too but I get her to go back to bed. John & Rob were asleep from utter exaustion on one bed and Hattie laid beside Edith who breathed deeply. I alone kept watch from that time till half past six. At five I noticed the death dew on her hands. Friday December 9th 1898 When the Dr came at eight oclock he told us the end was not far away. We kept the death watch during the forenoon. Father, Ott and Lee were down stairs. Aunt Emma and Allie were with us up stairs and Will got there in time to see her breathe her last at eleven oclock. Oh how can we live without our sweet Edith. God help all of us. Will and I came home in the afternoon. 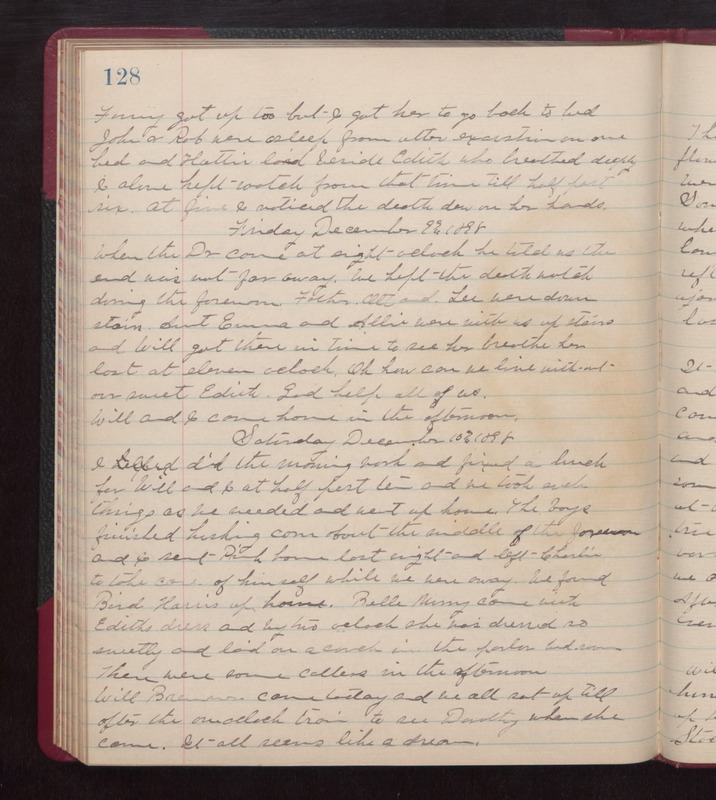 Saturday December 10th 1898 I did the morning work and fixed a lunch for Will and I at half past ten and we took such things as we needed and went up home. The boys finished husking corn about the middle of the forenoon and I sent Pink home last night and left Charlie to take came of himself while we were away. We found Bird Harris up home. Belle Murry came with Edith's dress and by two oclock she was dressed so sweetly and laid on a couch in the parlor bedroom. There were some callers in the afternoon. Will Bremmer came today and we all sat up till after the one oclock train to see Dorothy when she came. It all seems like a dream.